Memorizing Scripture has been an area in which I’ve struggled. I came up with a process that has helped me a lot. I wanted to share this because someone else could be struggling with the same thing. It’s important for Christians to know the Scripture. We need to arm ourselves with God’s Word and speak life to ourselves and others. The Bible lets us know how important it is to understand God’s Word. Deuteronomy 11: 18 NLT So commit yourselves wholeheartedly to these words of mine. Tie them to your hands and wear them on your forehead as reminders. Deuteronomy 6:6-7,9 NLT 6 You must commit yourselves wholeheartedly to these commands that I am giving you today. 7 Repeat them again and again to your children…. 9 Write them on the doorposts of your house and on your gates. Flashcards: I make flash cards of key Scriptures that I want to remember. So when I’m in a waiting room, on break/lunch, or when I have free time I pull them out to go over. Scripture of the Day: I take one of my flash cards and make it my Scripture of the day. My goal will be to have the Scripture memorized before I go to sleep for the night. Post Scripture: I take Scripture and post it around my home or desk at work. Examples: My bathroom mirror, my bedroom, my computer monitor. Record Scripture: I voice recorded all my flash cards and repeated each flashcard more than once. My recording is an hour-long. I listen to this when driving, cleaning, walking the dog, and getting ready for bed. Sometimes I play this while I’m in the bed. 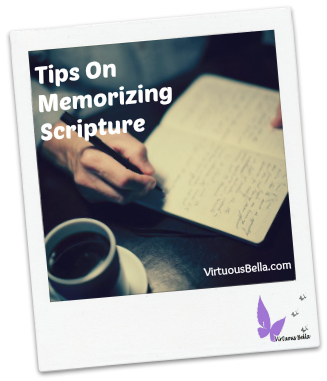 I hope some of the things I do can help you in memorizing Scripture. If you have any other tips for memorizing Scripture, please post them below in the comments section. Stay Blessed.